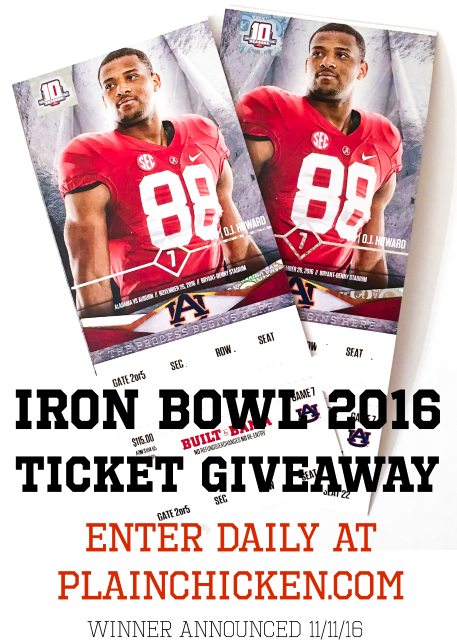 We are giving away a pair of tickets to the Auburn vs Alabama game! At the beginning of the season I would have said this wouldn't have been much of a game. BUT NOW it is shaping up to be a good one! Both teams are playing great! Bama will probably still be undefeated and Auburn could be rolling into Tuscaloosa 9-2. No matter what the record, major bragging rights are up for grabs! The game is November 26, 2016 in Tuscaloosa, AL. If you have never been to an Auburn-Alabama game, you are really missing out. I think it is the greatest rivalry game EVER! It should be on the bucket list of any sports fan!!! The giveaway ends on November 11, 2016 at 11:59 CST. If you are viewing this email in a RSS reader or email, you will need to come directly to the post to enter. This post is sponsored by Plain Chicken, Chicken Legs, Jack, Fluffy and Squeaky. oh, I would love to win these tickets! My middle daughter, Lura, is the biggest Bama fan I know! Lura is a disabled Veteran and it would be such a wonderful thing to surprise her with tickets to this game. RTR! Really hope I win fingers crossed!! !